Moving, unsettling, and violent — Mother Courage and Her Children is a harrowing watch, but unquestionably worth it. In this production, Anna Jordan rewrites Brecht’s original play, changing the setting of the 17th century Thirteen Years’ War to a dystopian future set in 2080. In this future, Europe has collapsed and two factions, the ‘reds and the blues’, fight over the ‘grids’ that are left in the world. Almost all theatre, and indeed all current forms of art, will attempt to make a comment on the state of the world, and often the focus of this is on Trump or Brexit. I was concerned that this production would focus too much on Brexit, that it would lose focus on the story. However, my fears were unfounded. In this new setting, the central focus remains fixated on the struggles of the titular character and her children, and the question of why we choose to carry on even in dire circumstances. The gritty set evoked a feel similar to that of Cormac McCarthy’s The Road. It consisted of wired fences, a run-down ice-cream truck, and large barrels used to make fires or to sit on, creating an appropriately bleak tone. We journeyed through this apocalyptic wasteland with the protagonist Mother Courage, as she tried to make a living dispensing food, weapons, and medical equipment to the warring factions. At the same time she must keep her three children safe from such horrors as being enlisted to fight in a savage war, killed, or raped. 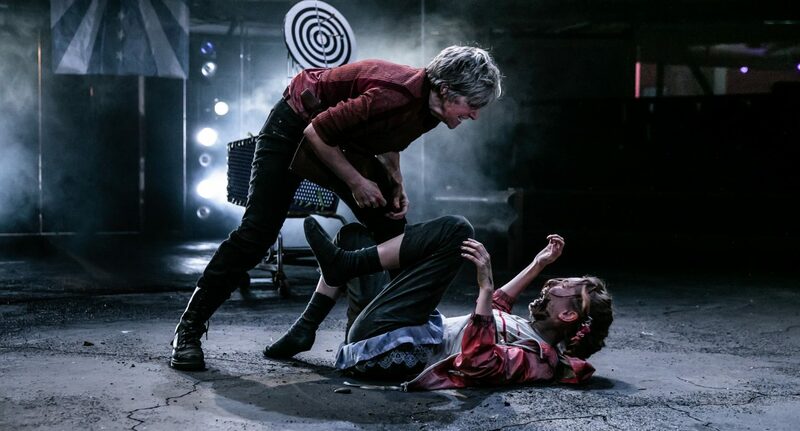 Julie Hesmondhalgh as Mother Courage brought a captivating energy to the stage. Every time she was on stage you were unable to take your eyes off her. Small gestures such as a roll of the eyes, or a moment of emotional pain in her face, served as some of the funniest or most heart-wrenching in the play. Hesmondhalgh had the difficult job of portraying a character who is selfish, ruthless, and greedy, yet to whom the audience will ultimately be sympathetic. She excelled at this. Her performance never shied away from the morally reprehensible side of the character. However, she achieved likability through witty, humorous dialogue, and moments in which her love for her children shines through, no matter how twisted that love may be. The supporting cast also have to be praised here, particularly Rose Ayling Ellis as Courage’s mute daughter, Kattrin. She was able to convey the curiosity, dissatisfaction, and pain of the character all through facial expression and movement. The sound design for the play was highly effective in building suspense and creating an atmosphere of constant threat. Loud sirens, explosions, and gunshots were in almost all of the play’s 11 scenes, putting the audience on edge even during quiet moments. Additionally, the musical sequences added a lot to the play, drawing out more of the elements that could deem it a dark comedy. It is true that this play can be difficult to sit through due to its violent content and cynical worldview. However, Jordan perfectly paced the story, keeping it at a trim two-hours-and-twenty-minutes including the interval. I personally never lost engagement in the narrative. Though the switch to a post-apocalyptic setting worked in some ways, I also feel that it created some significant problems. This was most notable in the emotional climatic scene. What was originally simply a stealth attack on sleeping victims became a gas attack. I felt this took away from my immersion into the drama. Surely a gas attack would kill these civilians regardless of whether they were asleep or awake? Thus the tension of whether or not they would wake up in time lost much of its impact for me, which is a shame as other than that it was a perfectly performed and directed conclusion. Despite some minor issues with the setting, I would highly recommend Mother Courage and Her Children, both to fans of Brecht and to relative newcomers such as myself.